For almost a year now, New York-based freelance writer Rhianna Jones has been signing a lot of her emails with, "insert Afro emoji here." That's because there is no Afro hair emoji. Jones, 28, hopes to change that. "I think an Afro should be included because there's an entire community of people — black, Afro-LatinX diasporic ... the Jewfro — there's just a lot of people that have hair that grows upward and spherically and defies gravity," Jones said. "There's been a big dearth and lack of representation of natural hair and Afro hair in the media. I think the lack of Afro hair in our keyboards is a subtle but constant reminder of that." "It's a pretty lengthy process, so I hope that they're listening and I hope that they know that we all really want this," she said. The emoji that she and Gibson designed is named Frolange, after the singer Solange Knowles, who Jones said has "absolute fly girl hair." Jones added that Gibson designed the Afro hair emoji to "take up as much space as you can in the very, very minute parameters of an emoji." "What's difficult about Afro hair is you really can't encapsulate the multi textural complexities — it comes in all different colors and coils and shapes," Jones said. Both Jones and Gibson are women with Afros who want to see themselves better represented in the media. 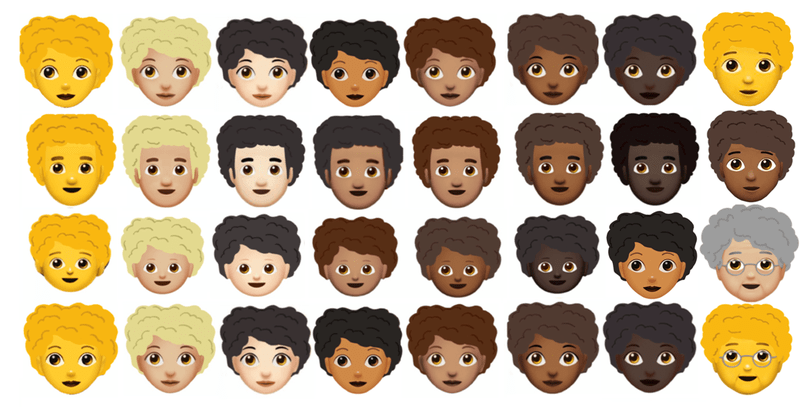 For Jones, the inspiration for the emoji came just after she celebrated Black History Month in February when she realized that instead of writing "insert Afro emoji here," in her messages, she wanted to have an actual Afro emoji to use. "I just realized that I shouldn't have to do that anymore, because it's more than just an emoji — it's about people being able to see themselves reflected in the conversations they're having not only on screen but in real life," she said. "I really just think this is a small step towards making our hair and our culture part of the universal language of beauty and of life. "